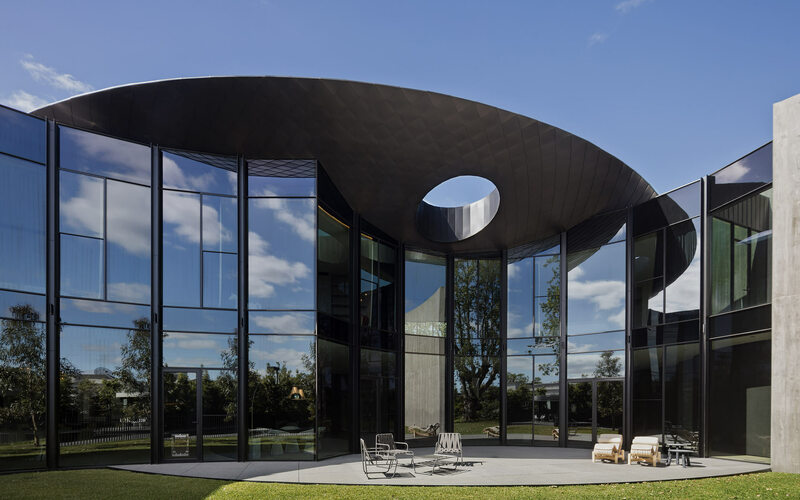 Every zinc panel of the striking Toorak home was manufactured and supplied by Zinc Iberico, the exclusive distributor of elZinc. The finish is elZinc Rainbow Ebano / Black in Flat Lock Tile. Designed by Wood Marsh Architecture, Toorak House stands as an abstract merging of roof and wall. A bowl-shaped, doubly-curved roof sits on a raw, textured concrete façade which wraps and articulates the internal volumes of the building. Engaged to resolve manufacturing and construction difficulties present in the technical design of the zinc-clad roof, Architecture Research Material Applications (AR-MA) worked with Zinc Iberico in consultation with Wood Marsh Architecture to produce a system capable of realising the architect’s formal intent. Developing and implementing an efficient workflow capable of rationalising the complex geometry present in the roof’s curvature and outputting all required set-out and shop drawings, AR-MA worked across multiple software platforms to coordinate all material, fabrication, and design constraints present. This included sheet-metal detailing and the simulation of the folding behaviour of the zinc panels, to ensure the perfect fit of all parts on site. Working on top of the structural steel which set out the roof, AR-MA developed an intelligent material build-up to adhere to the tight tolerances required to implement the architect’s aesthetic desires. Two layers of timber clad the builder’s steel work, to set out the zinc panels and provide a surface for fixing, over which interlocking zinc panels are positioned. A combination of off-site, factory fabrication and on-site assembly and installation was used to promote project efficiency and reduce waste.